Students, faculty and staff listen to the panel discussion with Sen. Ben Sasse during a Charter Week event Feb. 11 at the Coliseum. 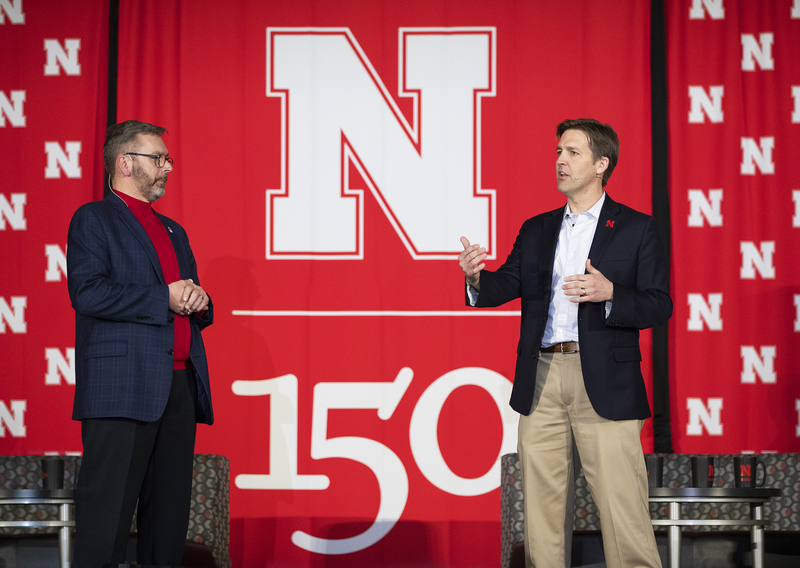 More than 500 Huskers listened as U.S. Sen. Ben Sasse participated in a question and answer session with students, faculty and staff in a Charter Week kickoff event on Feb. 11 at the Coliseum. The presentation explored the question, “Why Don’t We Get Along? 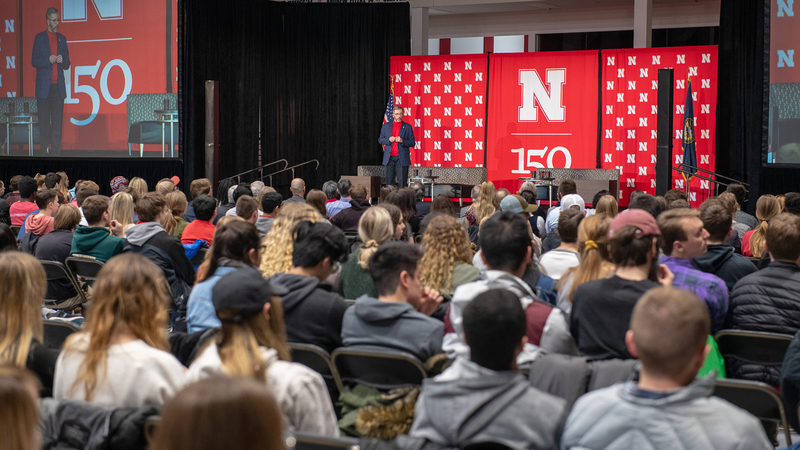 How Huskers Can Change the Future.” The event featured a panel discussion in which three Huskers — Hunter Traynor, senior political science major; Grace Chambers, junior sociology major; and Kamryn Sannicks, a junior political science major and member of the Nebraska National Guard and UNL’s Army ROTC program — talked face-to-face with Sasse. The panel was facilitated by Patrice McMahon, director and chair of the University Honors program. Sasse also met with student leaders prior to the conversation in the Coliseum. Those leaders were from the Chancellor’s Leadership Class, Office of Academic Success and Intercultural Services, and Association of Students of the University of Nebraska. Opening and closing remarks were provided by Chancellor Ronnie Green. Learn more about Charter Week at Nebraska and the N150 celebration. 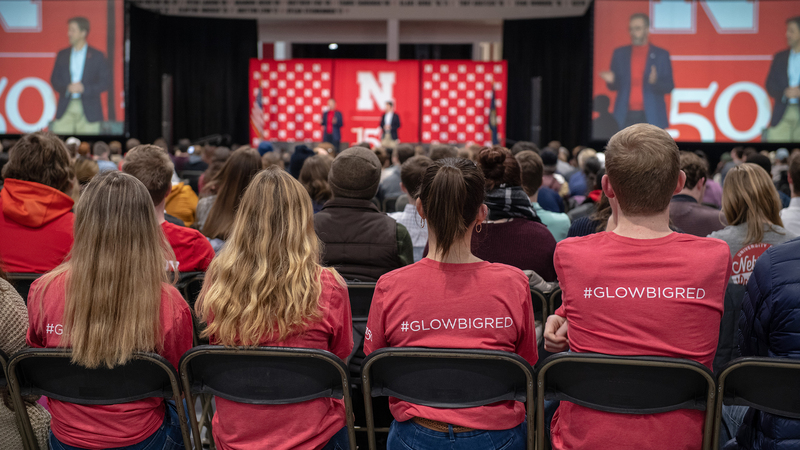 Students herald the Feb. 14 Glow Big Red Charter Week event on T-shirts during the Feb. 11 conversation with Sen. Ben Sasse. 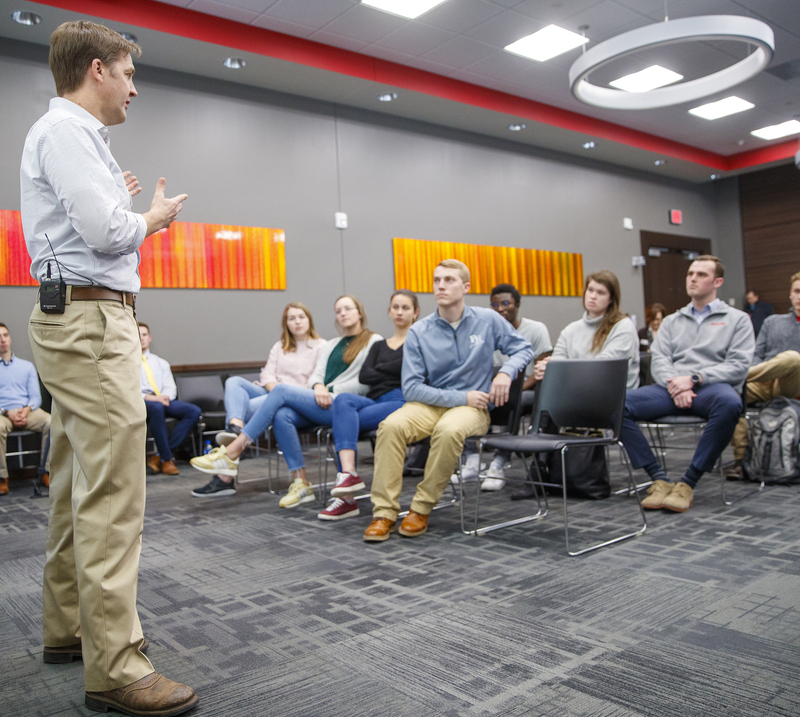 Sen. Ben Sasse talks with members of the Association of Students of the University of Nebraska during his Feb. 11 visit to campus. Sen. Ben Sasse answers a student question during the Charter Week event. 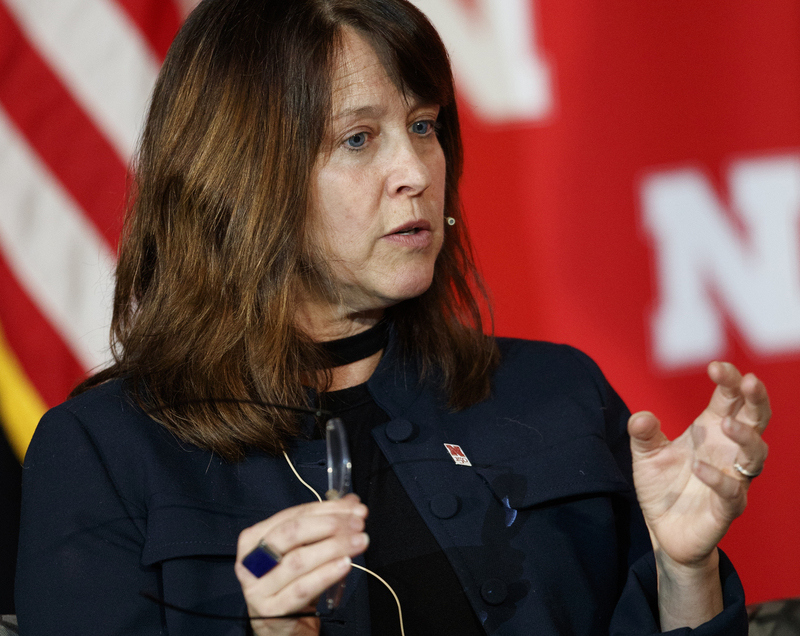 Patrice McMahon, director and chair of the University Honors program, helps guide the panel discussion between Sen. Sasse and Husker students. 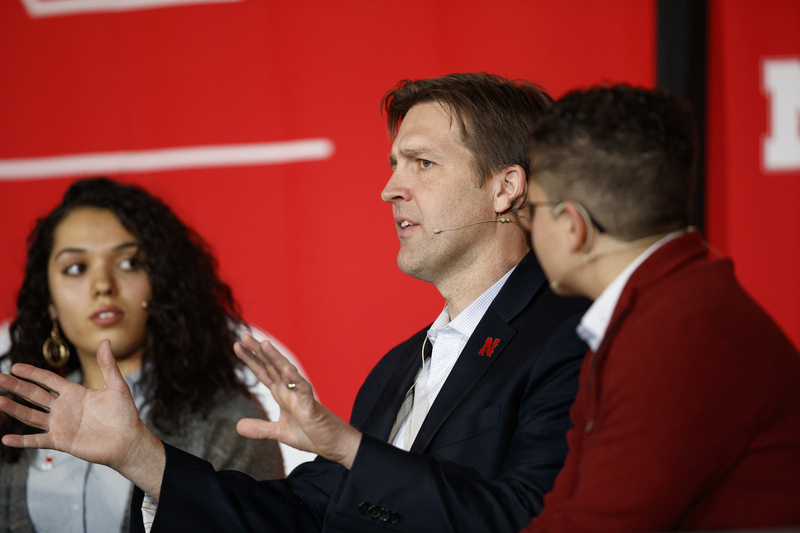 Huskers listen and react during the conversation with Sen. Ben Sasse in the Coliseum. The event opened the university's Charter Week celebration. 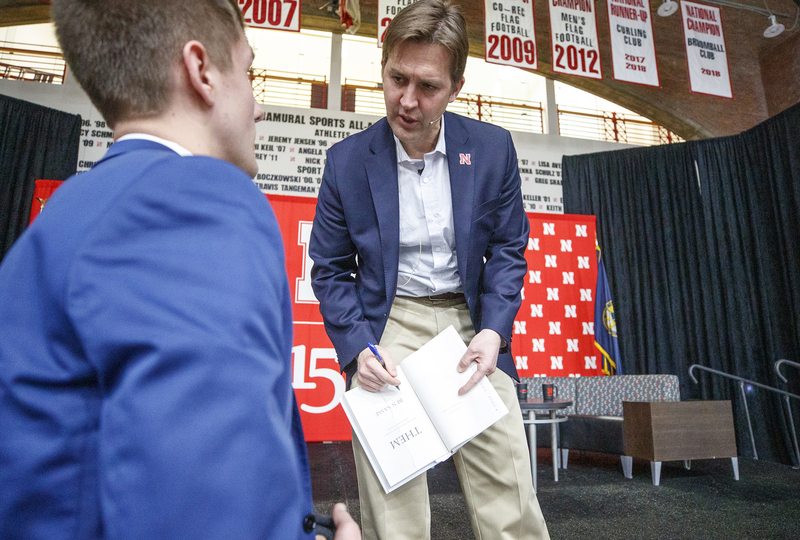 Sen. Ben Sasse autographs a copy of his book for Garrett Streeks, junior from Lincoln, after the Feb. 11 visit.